Department of Education includes GIS in secondary/senior school curriculum. 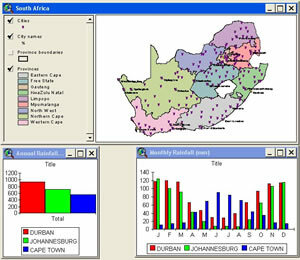 "Paper GIS" was developed for schools lacking computer resources. 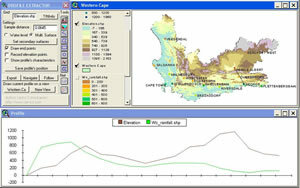 ArcExplorer and ArcView are provided to schools with computer access. The paper GIS targets those schools with no computer access at all. 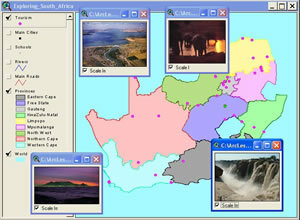 The South African National Department of Education included GIS in the curriculum for the first time in 2006. The introduction of GIS is taking place as a phased approach over the last three years of secondary/senior school. South Africa is divided into nine provinces, each with its own Provincial Department of Education. The Provincial Departments are overseen by the National Department, which is responsible for strategy and implementation, as well as training of senior curriculum advisors. It is, however, up to the Provincial Departments to ensure that all schools are introduced to GIS via the curriculum advisors in their respective provinces. The inclusion of GIS was met with apprehension by the educators, as most of them had not heard of GIS and there was a lack of skills for imparting this knowledge to the students. Day 2 introduced computers and ArcExplorer, and on day 3, the curriculum advisors were trained to use ArcView. 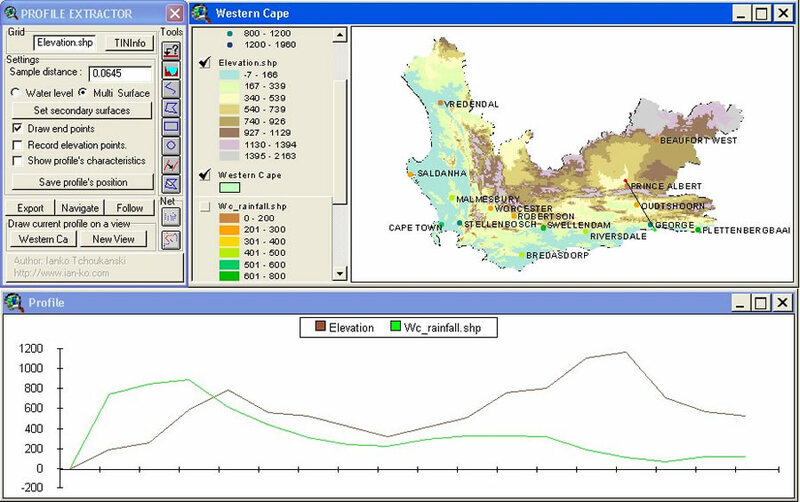 Seasonal Rainfall in South Africa. Scenic visuals of tourist attractions in South Africa. Huge differences exist between schools in the rural and urban areas with rural schools lagging behind in resources, such as well-qualified teachers and access to electricity, infrastructure, and funding. These limitations needed to be addressed when material was being developed. The government relied heavily on the private sector to facilitate the introduction of GIS. GIMS (Pty) Ltd. (the Esri distributor in South Africa) took the initiative to assist and approached former geography teachers and other key people to guide the development of educational material. Complete GIS materials were developed to address the full spectrum of GIS educational needs in the Department of Education. The new GIS school materials include three separate approaches corresponding to the fundamental steps for learning GIS: namely, paper GIS, ArcExplorer, and ArcView. All materials are based on Esri technology and terminology, as they provide the most appropriate and cost-effective GIS software tools to deal with the various levels of resources available to schools. The paper GIS was developed in collaboration with the Department of Land Affairs and the University of Pretoria. Paper GIS targets schools with no computer access. ArcExplorer satisfies the needs of schools that have limited access to computers (a single computer in a school), and ArcView addresses all GIS requirements that might be needed for schools with access to computers. Included with all three is fundamental training, covering the basics of GIS theory and relevant software knowledge. At the beginning of the year, curriculum advisors countrywide were flown or driven to GIMS's Midrand offices to attend a GIS training course. As curriculum advisors have schools with different levels of computerization under their supervision, the National Department of Education decided to expose curriculum advisors to all threepaper GIS, ArcExplorer, and ArcView. Approximately 100 curriculum advisors attended the three-day training over a period of three weeks. Cross-section from George to Prince Albert, showing the relationship between elevation and rainfall. 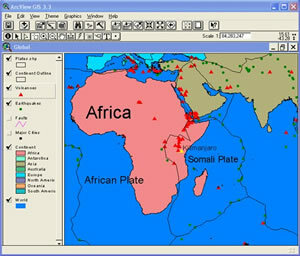 View of Africa showing the plates and incidence of Volcanoes and Earthquakes. Day 1 saw the facility transformed into a training center for schools with no GIS computer facilities. 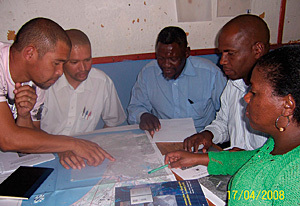 Curriculum advisors were given a simple GIS task to complete with the aid of maps (courtesy of the Department of Land Affairs), crayons, and tracing paper. The task involved searching for the best location to evacuate residents in the event of a flood. This paper GIS proved very important for teaching conceptual issues of GIS before moving to the computer. "The most important thing I learned was how to help my poorer schoolsthose without computersto do GIS," says Ntobe Peter Ndima, senior education specialist, Nkangala region, Mpumalanga. "I am happy they will not be left behind." Day 2 saw the introduction of the computer and ArcExplorer, and for some, this was their first experience working on a computer. The lessons were basic enough to eliminate the fear of the machine. 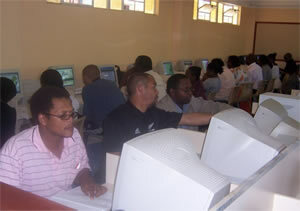 On day 3, the curriculum advisors were trained to use ArcView, helping them better teach geography where there is computer support. 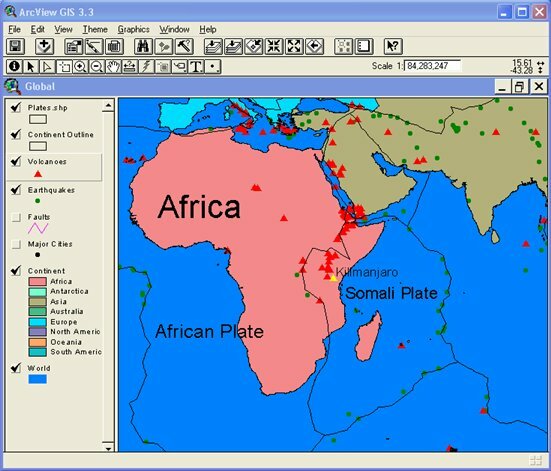 ArcView allows students to design their own research projects and to follow through with the investigation process, eventually producing maps and answering spatial geographic questions. For more information, contact Lizette Rust, GIMS (Pty) Ltd. (e-mail: lrust@gims.com, tel. : 27-11-238-6300), or Lauren Sweidan, GIMS (e-mail: lauren@gims.com).